· Mono-aqua -Pp detecting Photobacterium damselae subsp. piscicida causing Pasteurellosis. · Mono-aqua -Yr detecting Yersinia ruckeri causing Yersiniosis -ERM. 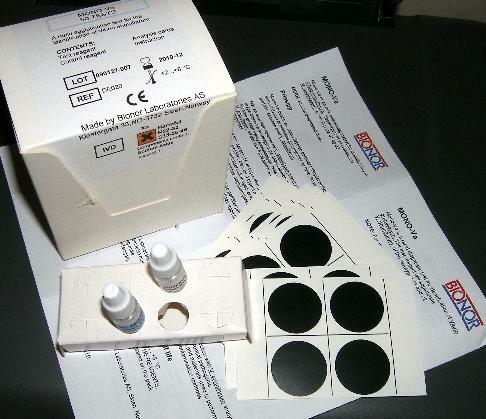 The Mono-Aqua test kits comprise rapid agglutination tests, rapidly verifying (30 sec.) the presence of specific bacteria on cultures. They are destined for laboratory use requiring prior seeding of samples on growth media. They are termed "in vitro" because they are not applied onto live fish (in vivo). The test reagent (specific antiserum) consists of mono-disperse particles coated with antibodies which form a visible granular particle agglutination pattern when mixed with the particular bacterium (antigen) that they are designed to diagnose. Apart from the test reagent, the kits are delivered with instruction leaflet and analysis cards. In addition, they contain a negative control reagent, consisting also of mono-disperse particles coated with non-specific, but closely related proteins in order to verify the positive result and exclude false positive results for maximum reliability. Each kit suffices for 50 tests. The Mono-Aqua rapid agglutination tests are applicable for a rapid preliminary screening of the pathogens isolated on culture, hence speeding bacterial identification and the diagnosis of the most economically important diseases. 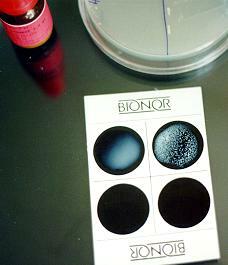 Verification of the positive result: In case of a positive result with the test reagent then similar application of the negative control reagent on a couple of bacterial colonies from the agar plate verifies against an occasional non-specific agglutination, which, albeit unlikely, may not be ruled out. When a drop of the negative control reagent is mixed for 30sec with the bacterial colonies on the analysis card, it should not produce an agglutination result similar to the specific agglutination. The vials with the “test” and “control” reagents. The Mono-Aqua rapid diagnostic kits are ideal for the fast and safe identification of specific bacteria as well as for the verification of their presence when grown on agar plates mixed with colonies of other bacteria. For laboratory use only. The test should not be performed under direct sun-light. Allow the reagents to reach room temperature (20o-25oC) before use. Shake the reagent vials vigorously before use. The reagent solutions must be homogeneous before use. Minimum sample quantity >1 bacterial colonies of about 1mm in diameter. Dispose off all specimens and materials used to perform the test by standard decontamination methods. 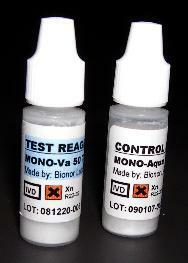 The Mono-aqua test kits should be stored refrigerated at +2o to +7o C. Avoid freezing. In a common refrigerator they last for at least 36 months and may be used several times according to needs. Always close vials properly after use. Reproduction of this website (or parts of it) is illegal and strictly forbidden. Every effort has been made to ensure that the information in the notes and papers contained and linked herein is accurate until the date of last editing. It is based upon the accumulated personal experience of applied work in the field. The author cannot take responsibility for incorrect interpretation and any resulting consequences. The contents may be used only as an educational guide and are not meant to become a stand-alone diagnostic tool or treatment manual or replace professional assistance.